Skincare, Beauty & Fashion Interchange ! A place to exchanges latest informations. 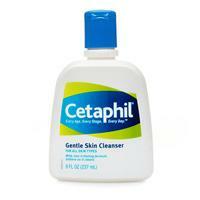 I adored HABA Squa Facial Soap for almost 2 years but I've changed my heart to Cetaphil Gentle Skin Cleanser! Cetaphil Gentle Skin Cleanser cleanse, moisturise and is gentle on skin. This cleanser will not strip the natural protective oils or emollient and disturb the natural PH's balance. I love the pleasantly tight (surprisingly cleanser that leave slight tight feeling is considered as good) after a wash with Cetaphil. I also like the fact that Cetaphil Cleanser can be used with and without water. Which means, I can massage my skin with adequate amount of Cetaphil cleanser and wipe it off with tissue or a piece of cloth. No rinse needed. Although, it's a cleanser and according to their website, Cetaphil Gentle Skin Cleanser can be acting as mild makeup remover. Seriously, I doubt so. I've seen plenty of reviews on it's makeup removing ability. So far, nothing fantastic came out. I have my DOVE Cleansing Foam, which I bought from Japan months ago hence I do not use Cetaphil to cleans up any makeup. Unless I have only sunscreen without a single trace of makeup. I always wanted to try Cetaphil..but the price seems to be stopping me. Thanks for dropping me some words. I'm very much appreciate your comments and share your thoughts with me. Do always come back for more! Simple as you can see. Let us talks about makeups, skincare, bags, shoes & fashions ! Makeup and Beauty Tips, Tutorials, Product Reviews, and More! Life Update , Follow me on my new blog!